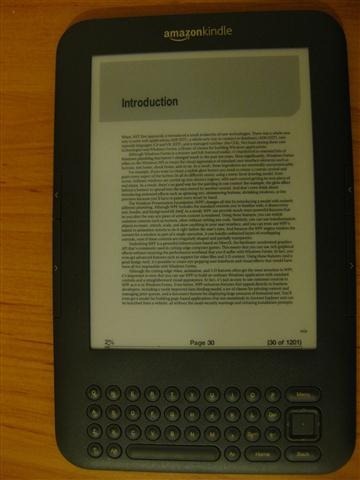 For Christmas 2010, and on a whim, I bought myself the 3G model of the Kindle 3. It finally arrived this morning, so it’s a late Christmas present. I guess I’m a bit late getting one of these since they’ve been out for a while. The thing is, I normally try not to buy books. Don’t get me wrong, I’m always reading something, but usually it’s books that friends have lent me (hi Trent). I don’t like accumulating books because I’m always moving house (or country) and books are another thing to lag around. Right now I have a shelf of books at my parent’s house that has been sitting there for more than 5 years. Lately I’ve been buying programming books though and those are usually very large and heavy. I left my copy of Code Complete 2 in NZ and I would have like to have brought it with me. I’ve also been reading books on my iPhone through iBooks. So far only free classics, like Sherlock Holmes etc. Programming books in PDF format are too small for the iPhone. I’d also been reading PDF ebooks on my netbook, by rotating the PDFs counter-clockwise in Acrobat reader, and then physically turning my netbook on its side. Very lo-tech. I’ve only been doing this at home though! So iBooks on the iPhone and PDFs on the netbook were beginning to convince me that ebooks are the way forward. So I took the plunge with the Kindle. Above: my 3 generations of ebook reader – netbook, Kindle 3 and iPhone. Kindle supports Amazon’s DRM native Kindle file format, .AZW. Yuck, I didn’t realise it was DRM until now. The good thing about reading .AZW ebooks (i.e. those you buy Amazon.com) is that you can choose the font size, line spacing etc. This means that .AZW files don’t really have page numbers, because depending on your zoom level and your line spacing settings a book could have more or less pages. Instead, each paragraph has a position number, and the little progress bar tells you how far through the book you are. Academics and students are up in arms over the lack of page numbers, because it means they can’t easily use ebooks in citations for academic writing. Another format it supports is PDF files. 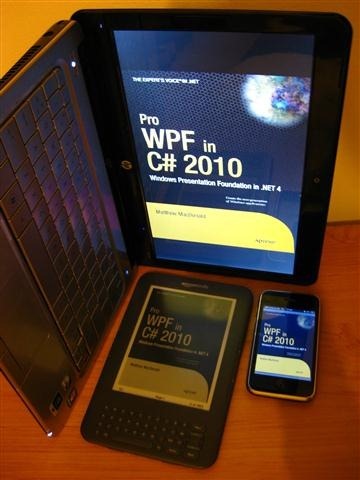 This was important to me as mentioned earlier, because I have PDFs of a number of programming books that I wanted to try to read on the Kindle. 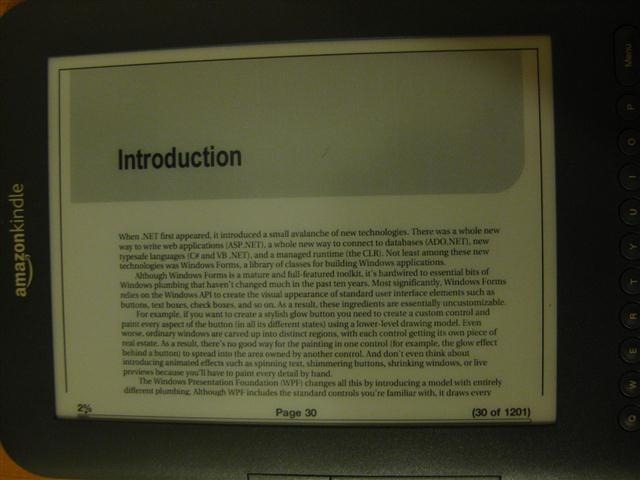 When viewing PDFs on the Kindle, the page numbers of the PDF are respected. But the downside of that is you can’t set your own font size and line spacing. The Kindle 3 is pretty small, about the size of a DVD cover. In fact I can fit the Kindle inside a DVD cover, which could make for an interesting and cheap carry case. And with all that bezel and the keyboard, the screen itself is even smaller. So when you view a PDF on that small screen in portrait mode the font size is really tiny. If you zoom in to make it more readable then you’ll have to constantly horizontal scroll which isn’t practical. A workaround is to put the Kindle into landscape mode, then the text is more readable and you only have to vertically scroll once to read a page. Above: But in landscape mode it’s OK. I only got the thing today so haven’t put any long hours in reading PDFs on it but I’ll update this post in a few weeks once I have. Now that I think about it, if ever there was a genre of books that quickly goes out of date, it’s programming books. So perhaps I shouldn’t have bought the Kindle for reading programming books on and instead just bought the books I want to read and then just leave them behind whenever I move house! But I think it’ll still be worth it for buying and storing non-programming books with. Now I can build up my (ebook) library without worrying about accumulating luggage. Well it’s been a couple of weeks now, and as far as studying programming books cover to cover it works fine. But in terms of replacing the stack of programming reference books on my desk, it’s a no go. It takes too long to find anything.